GABORONE. 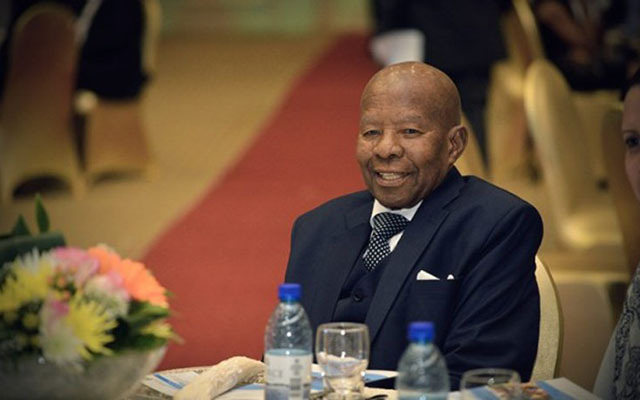 – Former Botswana President Sir Ketumile (formerly Quett) Masire has died. He was born in Kanye, Bechuanaland (now Botswana) on July 23, 1925. Sir Ketumile was Botswana’s second president who was in power from 1980 until 1998, after taking over from the country’s founding father Seretse Khama, father to incumbent President Seretse Khama Ian Khama. Sir Ketumile played a pivotal role in the fight for independence and sovereignty for Zimbabwe, Mozambique, South Africa, Namibia, Angola, among others. He was also instrumental in the formation of the regional bloc Sadc (Southern African Development Community) that is head-quartered in the Botswana capital Gaborone. He was hospitalised on June 15 in the Intensive Care Unit (ICU) at Bokamoso Hospital. On June 16, 2017 the Masire family informed the public that the former President had been hospitalised in Gaborone for surgery. He was listed in stable condition in the ICU. Sir Ketumile had failed to attend a dinner hosted in his honour and Foundation by two of the institutions that hold him highly, the Institute of Development Management (IDM) and the Ohio State University, USA. His daughter, Mmasekgoa Masire-Mwamba had to stand in for him. Last Saturday, doctors advised that the former leader was responding positively to treatment, but later in the week his condition was said to be “critical”. The government of Botswana yesterday said Sir Ketumile has been accorded a State funeral, and will be buried at his birth place Kanye, on June 29. His body will lie in state next Tuesday to allow members of the public to pay their respects, and a memorial service will be held in Gaborone on Wednesday, June 28, 2017 at a time and venue to be announced later, said the statement. “In the meantime, flags shall remain flying at half mast during the time of mourning, while books of condolence will remain open at Parliament, all district and sub-district headquarters and at all Botswana diplomatic missions abroad,” reads the statement from the Botswana Government. Meanwhile, President Khama yesterday announced three days of mourning. He added: “In this time of reflection, members of the public may continue to engage in public and private activities, but in so doing, are reminded to be mindful of the need to display behaviour that shows appropriate respect for the occasion. “From today until the time of the funeral, a condolence book will be also opened at Parliament for members of the public to pay their respects . . . May His Soul Rest in Peace and his family along with the rest of the nation be comforted in this time of sadness,” said President Khama. South Africa’s High Commission to Botswana, Mdu Lembede, paid tribute to the late Botswana president since he “created a passage for freedom fighters”. “He did not only do it for South Africans. It’s on the record that he did it for the region. “I mean all the leaders from countries around the region, at one stage or the other, they went through Botswana, whether it Sam Nojuma from Namibia, Robert Mugabe, Samora Machel in Mozambique, they all came here. “And they were taken care of, and he was the person in the forefront, and he was seeing to it that people are safe,” Lembede was quoted as saying. Meanwhile, social media users took to Twitter yesterday to honour Sir Ketumile, with some describing him as one of the “best leaders” on the African continent. Sir Ketumile led various diplomatic initiatives in Africa, including chairing a panel that investigated the 1994 Rwanda genocide, and co-ordinating the Inter-Congolese National Dialogue. – Mmegi/Herald Reporter/ News24.